Another day, another year. Now comes time to review the year 1874 and we've seen that prior to 1874 football looked nothing like the football we know today. Well 1874 brings good news and and also some bad news. The good news... football in 1874 is taking a big stride toward becoming American football - the bad news... the brand of football played in 1874 was far from what we can call modern football, and merely moving toward the style of football played in English rugby. Which is fine - we're examining the history of American football and there's no secret that the American game evolved from Rugby. I find it a little troublesome that in the search to find the "birthplace" of college football, partisan researchers have the tendency to credit the invention of football at one singular place (@ historical correction) or at one singular time, when if we want to look at one place in time, all evidence regarding the start of American intercollegiate football points to Princeton/Rutgers in 1869. Any fact-glossing beyond that ignores the steps taken by earlier teams to organize the sport. And in the case of the Harvard article point more to the innovations of the Canadian game than it does to the Harvard style of play. 1874 college football was played under three different sets of rules: 1) the F.A. rules set forth in 1873 by Rutgers, Princeton, Columbia and Yale 2) rules implemented by Harvard's "Boston game" and 3) the English Rugby rules introduced by Montreal's McGill Univ. In 1874 Harvard and McGill played a 2 game series in Cambridge, Mass where the first game, on May 14, was played using Harvard rules and a game the next day was played using McGill's rugby rules. The first game ended in a 3-0 Harvard win and the rugby game ended up tied 0-0, but by all accounts the rugby tie was more exciting, more entertaining and more enjoyable for the players. There was no score to this game (0-0), but McGill's rules dictated counting touchdowns as scores as well as goals - where in English rugby a touchdown only allowed for a try for goal. I take notice of things like this, but in several places it is noted that the second, tied, game was thrilling and exciting. I don't know what is lost on football fans of today that we can't see the value of a tie, but I'll take this opportunity to illustrate that ties are a big part of college football, from the first season when Princeton/Rutgers split 1-1 records to the Harvard/McGill tie that changed the nature of the game. Ties have always been there. 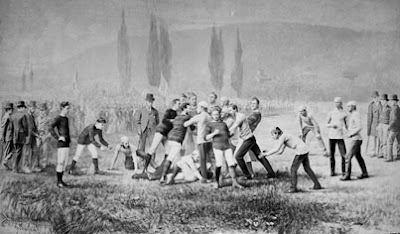 The game played the next day, May 15, was the first rugby game on U.S. soil. Harvard acquitted itself very well and struggled to a scoreless tie. More importantly, they fell head over heels in love with rugby and all thoughts of the once-cherished Boston Game disappeared. A third Harvard/McGill game was scheduled that year and in October the Harvard team traveled to Montreal to play McGill at rugby. This time Harvard won 3 touchdowns to 0 and while these international games weren't the start of college football they certainly were major steps in the game's evolution. There were also association football games played by Columbia, Princeton, Rutgers, Stevens Tech and Yale. These games cannot be diminished as those teams soon became involved in the handling game of American football. I believe I'm through with highlighting every game and every score, and now I will focus these posts on the changes in the game and honoring the best teams of a given year. For now I'll state that between 1874 and 1875 the most important ingredient to the evolution of college football was the natural rivalry of Harvard and Yale. In the next post, Harvard introduces Yale to rugby, a young Walter Camp watches on, and Yale's great teams were tempered under the fire of Harvard's new rugby game. As for champions, 1874 gives us a unique result with two undefeated soccer teams plus Harvard as the champion of the McGill rugby series. So accolades again go to Yale and Princeton as well as to Harvard with their newfangled handyball rules.